Henry, since when are you backpacking, and how did you start? How often are you out backpacking nowadays? I started backpacking at age 11 or 12. My parents signed me up for a week-long hiking trip for kids in Yosemite National Park. I hated the hiking part--it was another year or two before I started to like hiking--but loved the high mountain destination lakes and snowfields. Over the years I have spent a lot of time hiking here in the US and have had the privilege of hiking in Canada, New Zealand, the UK, Italy, and Nepal. There are a lot more places I'm anxious to hike but between business and family I struggle to find extended blocks of hiking time. These days I manage to get out for several hikes a year but limited to a week or two at a time. In 2010, I'm looking forward to doing the TGO Challenge in Scotland. 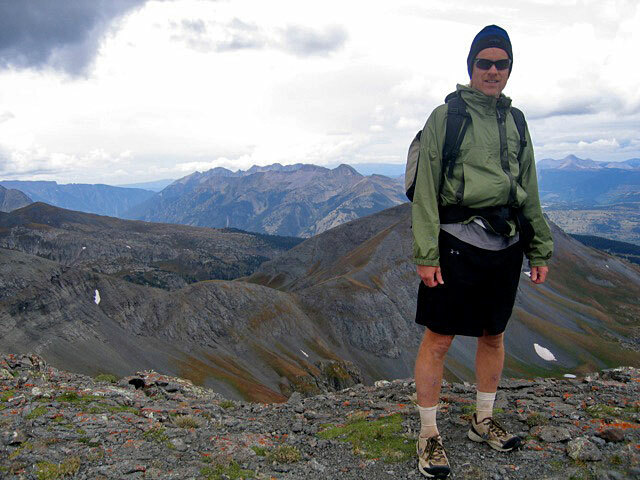 Henry on the Continental Divide Trail in 2008, Southwest Colorado. When I hiked the Pacific Crest Trail in 1999, I made a big change in gear and hiking philosophy. For that hike, I bought a sewing machine and made some of my own gear because I could not find commercial products that were light enough for my needs. Once of those pieces of gear was a lightweight tarp with attached bug netting. That shelter ultimately started me on the tent-making path I'm on now. Already since a few years you are making a name for yourself with Tarptent. Can you tell a bit more about how you started the company, and how it developed over time? Shortly before I left on my Pacific Crest Trail hike, I published a webpage with plans for making the original tarptent. When I came back from the hike I updated the page and began to get emails from hikers wondering if I would make a tarptent for sale. In those days I forwarded those requests off to a friend's sewing company and went on with my life. Then, the following summer, my wife took the tarptent on a hike with friends and came home complaining that it was too hard to set up. So, in an effort to make her happy, I went about trying to improve the original design. I thought it would take me a weekend but it took months before I settled on what would later become the original "Virga" (and larger "Squall"). By then I had invested quite a bit of effort and decided to try to recoup my investment by getting a few of them made--I hired a friend's sister to do the sewing--and selling them direct on a new website called "tarptent.com" I honestly thought that there would be a market for perhaps 50 of them and that would be the end of it. Long story short, demand far exceeded my ability to produce and it was several years before I found real manufacturing and was able to make enough product to mostly keep up with demand. In the early days, I really had no idea how to design. I knew nothing about computer aided design (CAD) and only had very primitive computer programs that were ok for flat line drawing and not much else. The product line grew very slowly as I acquired better tools and learned how to design. Now I use advanced CAD tools and have learned a lot about design just by doing it over all these years. Design is hard, at least good design is hard, and I try to design tents that have not been done before. The thrill of designing something new and better is really what keeps me going. We have doubled our product line over the last year. We can't keep going at that pace in 2010 but I do expect to slowly add more models as well as refine the ones we have now. 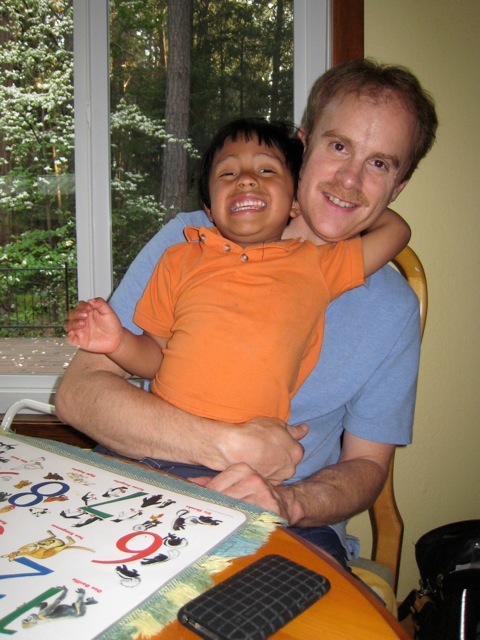 Henry with his son Stuart - the next generation Tarptent genius! Your newest creations, the Moment and the improved Scarp 1, were very well received. Can you tell us what is the most popular Tarptent? And from where do your customers come? Over the last year or two, the Contrail has been our biggest seller. I think the popularity is due to a combination of simplicity, pack size, weight, space, and price--not necessarily in that order--and there really isn't anything on the market that hits that combination quite as well. The Moment is our latest shelter, and one of which I'm quite proud, but is only just on the market (and quickly sold out) so it remains to be seen how well it will do in the long term. The Scarp 1 in another design that I'm quite proud of but it is in a very different class than the Contrail, especially price and weight, so we don't sell nearly as many of those as we do the Contrail. The revised Scarp 1 (out next month) will, I think, be more popular than the first generation model especially with our customers outside the US looking for more robust shelters for use in harsher climates. We sell all over the world but the US and Canada are certainly our primary markets. We have a growing market in Europe--it fluctuates somewhat with exchange rates--and another one in Australia/New Zealand. Asia, South America, and Africa are much smaller markets for us as I imagine they are for other tent companies as well. What kind of new innovations can we expect in the next years from you? If I knew the answer to that question, life would be much easier. Innovation is more perspiration than anything else. Design for me happens very organically and usually as a result of banging my head against a concept or concepts for a long time. Sometimes I just push existing designs to see what else pops out. The Moment happened that way (out of the Scarp 1 which happened out of seeing what I could do with a foldable corner support). Other times I try to make support structures out of trekking poles and one or more other poles and see what happens: Squall 2 and Rainbow happened that way. Materials innovations are not something I control but certainly we're all waiting for advancements and I will use new materials as performance/ratios improve. Long story short, all I can say is that I'll keep working at it and, with luck and lots of hard work, new things will take shape. I can also say that I could not imagine doing what I do without CAD. It allows me to think in ways that would otherwise not be possible. The Tarptent office and workshop with a few Moments set up on the grass. What is your own favorite tarptent? Did you make it yourself? Whatever I've worked on most recently is the generic answer to that question. For general 3-season use, I will using the Moment going forward. I don't use trekking poles so, for me, it's the perfect combination of quick setup, space, and weather protection and I'm willing to pay the small weight penalty over our other models that use trekking poles. You were hiking this summer in Washington state. What was your baseweight, and which pieces of your gear did you make yourself? Honestly, I didn't weigh my pack so I don't know. I did take the Moment as well as my favorite homemade piece of gear: a down quilt. I think there is a general industry trend toward lighter weight gear. 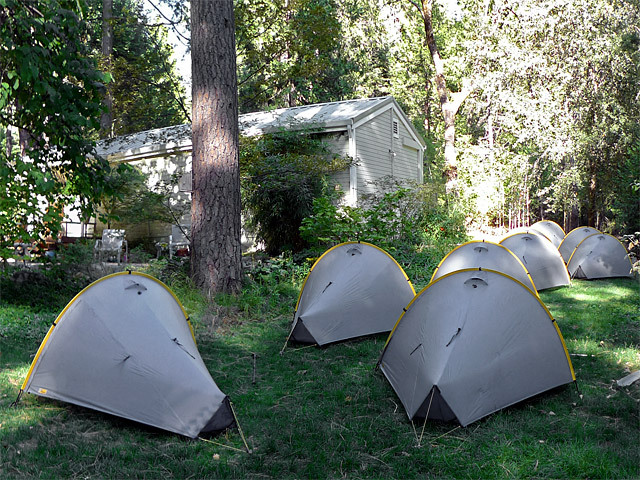 Given a choice between a 5-lb tent and 3-lb tent, both of which do the same thing and cost the same amount, consumers will generally choose the lighter tent. However, I don't think any of the larger, mainstream companies will push completely into the ultralight realm because costs really start to go up when dealing with very light, high price fabrics like silnylon, spinnaker, cuben etc. And when large companies do foray into really light gear, their retail price points go far above what the cottage gear makers can do. Nearly all the mainstream companies manufacture offshore in order to sell retail so making things as cheaply as possible drives the business directions for most companies. "Mass Market" means mass production and mass retail marketing and that's a whole different business model. The smaller companies, like Tarptent, sell direct and have very low overhead so we can afford to use lighter, higher priced fabrics and still keep the finished products somewhat competitive with retail price points. The downside of the "niche" market approach for us is that our volumes will always be much lower but I do think there's room in the ecosystem for both approaches and the customer ultimately benefits. Is the cottage industry cooperating "behind the scenes" with each other? Are you for example in touch with Ron Bell from MLD, Brian Frankle of ULA or any of the other small manufacturers, and talking about developments and the like? I don't know Ron Bell personally--we have exchanged an email or two--but Brian Frankle is a friend as are other "cottage gear" founders and, yes, we do talk about manufacturing, problem customers, materials sources etc. I really enjoy my fellow gearmakers and there's a real camaraderie among us. Henry, I thank you for taking the time to answer my questions. Is there something you would like to add? Thanks for your blog. I read yours and others and learn a lot. Sitting here in an office a great deal of the time is otherwise pretty isolating and blogs such as yours are a great way to keep in touch with what the industry is doing and how customers are reacting.